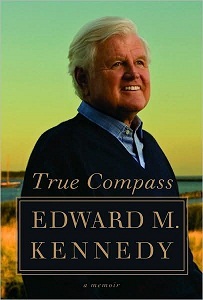 This book is Ted Kennedy's legacy. He started the book before his diagnosis in 2008 of terminal cancer, but he finished the book knowing that it would be his legacy. He says in this book everything he avoided saying for decades: he uses it as a confessional as well as his long-awaited autobiography. Journalists have most long waited for Ted's view on his elder brothers John Kennedy and Bobby Kennedy. Previous biographers dwelled on the glassy-eyed look with which Ted would stare down reporters who asked about his place in "Camelot," the term encapsulating everything positive about the Kennedy presidency and JFK's and RFK's legacy. Ted indeed uses the term "Camelot" in this book (p. 343-4) and details his place in the Kennedy legacy, and candidly outlines his views of JFK and RFK. Ted does NOT candidly outline his role in Chappaquiddick, the scandal which precluded his own chances for the presidency. Yes, Ted explains his role and apologizes profusely (p.288-9). But "Chappaquiddick" isn't in the index; while "The Harvard Screwup" gets a whole chapter. "The what screwup," you ask? "The Harvard Screwup" refers to Ted getting suspended from college for a year after getting caught cheating on an exam (see excerpt, p. 95-6). Ted evidently worried a lot that "The Harvard Screwup" would damage his political future--but really, the public wanted to hear more about Chappaquiddick! But it only gets squeezed in between Vietnam and Watergate. Nevertheless, this is an important book for any would-be pundit or anyone interested in political history. It's also a great guide to the real workings of the Senate. And for the real workings of the Kennedy clan. And for Ted's opinions on President Reagan (he didn't like him) and President Carter (he REALLY didn't like him). And for Ted's take on everything else important in the last 50 years. William Rehnquist: 1971: Dedicated to free society, not integrated society. Jimmy Carter: 1976: first support of Ireland in Democratic platform. Jimmy Carter: 1977: lectured Senators on minutiae about Africa. John F. Kennedy: 1963: Ich bin ein Berliner; freedom is indivisible. Ted Kennedy: 1960: Toured newly-independent Africa with Senate delegation. Ted Kennedy: 1968: Pressed for aid for refugees from Biafra. Ted Kennedy: 1972: Resolution for uniting Ireland & British out of North. George W. Bush: Roberts nomination:attorney/client privilege limits evidence. Richard Nixon: OpEd: Instituted ideology basis for judicial nominations. Ted Kennedy: 1969: Reject Supreme Court nominations on basis of ideology. Jimmy Carter: 1977: Incremental approach instead of universal coverage. Ted Kennedy: 1972 book, "In Critical Condition", favored national system. Ted Kennedy: 1974 cancer fight: address inhumanity of healthcare system. Ted Kennedy: 1977: preferred single-payer but it's politically impossible. Jimmy Carter: 1979 "Malaise speech": a crisis of our national will. John F. Kennedy: 1960: Today we stand on the edge of a New Frontier. John F. Kennedy: The Catholic Question: I follow both my conscience & nation. John F. Kennedy: Camelot: romantic model of public service & inspiration. Richard Nixon: 1971: "Enemies list" tallied 47,000 people. Richard Nixon: OpEd:1971 Pentagon Papers drove Nixon to secrecy & Watergate. Ronald Reagan: OpEd: Reagan in 1980 was a movement, not just a candidate. Ted Kennedy: Mother's father Boston mayor; father's father state rep.
Ted Kennedy: 1939: lived in London as child of American Ambassador to UK. Ted Kennedy: 1951: caught cheating & suspended from Harvard for one year. Ted Kennedy: Chappaquiddick was horrible accident, but I was responsible. Ted Kennedy: Inspired by JFK's & RFK's legacy; but not their surrogate. Ted Kennedy: 1980: Lost Iowa caucus due to Secret Service impositions. Richard Nixon: 1971 ITT scandal: dropped antitrust suit for $400K donation. Richard Nixon: Installed voice-activated taping system in Oval Office. John F. Kennedy: 1940: best-seller, "Why England Slept". John F. Kennedy: 1943: PT-109 rammed; crew rescued from South Pacific. John F. Kennedy: 1961: Accepted sole responsibility for Bay of Pigs disaster. Richard Nixon: 1968: Secret plan to end war morphed to secret bombings. Richard Nixon: 1972: Signed first SALT treaty during visit to Moscow. Ted Kennedy: 1968: gap between Vietnam rhetoric and reality on the ground. Ted Kennedy: 1969 Vietnam strategy was senseless, like "Hamburger Hill".